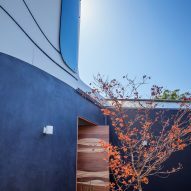 The undulating metal exterior of this family home in Venice Beach by Los Angeles designer Mario Romano takes its cues from the movement of the ocean. 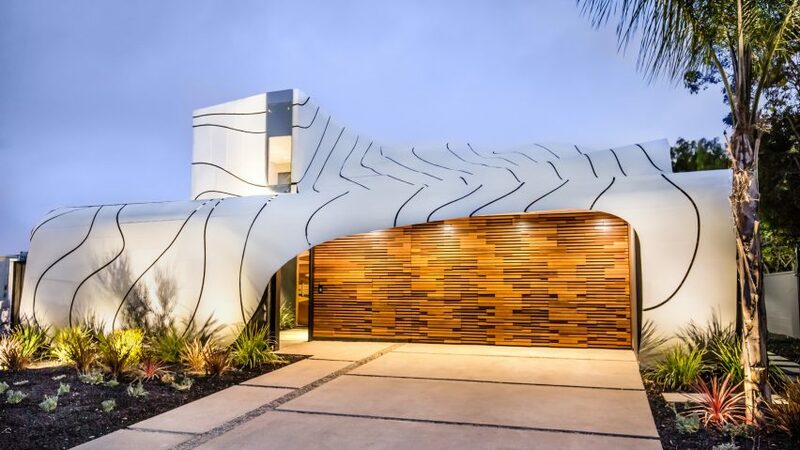 The Wave House is located in a beach town in the Los Angeles metropolitan area, about 30 minutes drive west from Downtown. 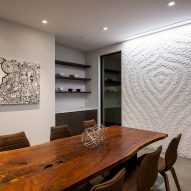 Encompassing 5,700 square feet (530 square metres), the home features fluid living spaces and carved surfaces that are meant to mimic organic geometries found in nature. Constructing the residence required "trust in the power of calculus and the development of an entirely new architectural vernacular", said Romano, a local designer who uses digital tools to create complex forms. 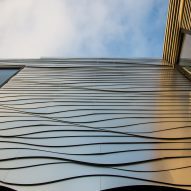 For the exterior cladding, over 300 white aluminium pieces were arranged to evoke a feeling of an ocean swell and crashing waves. The pieces are affixed to a metal substructure. Romano was able to create lines without repetitions or seams using computer numeric controlled (CNC) technology and customised digital tools. "Appearing as one massive undulating facade, the painted aluminium flows over two storeys until arriving to touch the ground in one single movement," the designer said. On the street-facing elevation, the skin pulls back to reveal a wall made of stained cedar blocks. On the backside of the home, the architect cut away areas of the metal screen to accommodate glazed apertures. The rippling character of the exterior is carried indoors, with textured surfaces being deployed in certain rooms. 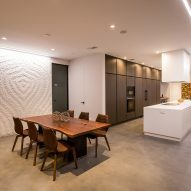 "Walls and floors are lyrical and like nature, without any repetition, bringing the landscape environment inside the home," said the designer. The first floor of the dwelling contains living and entertainment spaces, while the second storey encompasses five bedrooms. At ground level, retractable glass walls enable rooms to be fully open to the outdoors. On one side of the home, Romano created an open-air void that serves as an outdoor living room. The home's numerous openings – along with its garden, swimming pool and jacuzzi – capitalise on the year-round temperate weather in southern California. Other dwellings in the Los Angeles area include an angular white residence by Arshia Architects in the Hollywood Hills and an Echo Park house by Anonymous Architects that was built around an existing cypress tree.